The Bled Congress Centre is more well-known to the wider public as the Bled Festival Hall. As such, it is well recognised and enjoys a reputation for its combination of cultural and congress programmes. The hall was built in 1961 for a chess grandmasters tournament. In the period that followed, the hall hosted a wide range of events from top Slovenian music acts to numerous congresses and other events. In 1989, prior to the Bled World Rowing Championships, the first major renovation of the hall took place. In 2017 the southern part of the Festival Hall underwent thorough renovation. The hall illustrates the philosophy of the future development of congress infrastructure in Bled, which is not based on expanding capacity but rather on improving its quality. The Festival Hall occupies one of the most beautiful and prestigious locations next to Lake Bled and has superb views of Slovenia’s only island and the magnificent Bled Castle. It is this location that also makes the congress centre suitable for celebrations, weddings and other protocol events. The natural environment of Bled and the surrounding peaks of the Julian Alps make it exceptionally attractive for business meetings, as nature fills people with energy and creativity. Bled and its surroundings also offers a wealth of possibilities for interesting incentive programmes. Bled is easily accessible. Slovenia lies in the heart of Europe and can easily be reached by air, road and rail. Ljubljana International Airport is a mere 30-minute drive from Bled, while Klagenfurt Airport in Austria is another nearby option. Bled is compact, with all its facilities and sights being within walking distance. Since the majority of visitors to Bled arrive by car, we rate its accessibility as very good, other than the problem of parking in the surroundings of the congress centre. Opinions are divided about the architecture, however, the building, with its large glass surfaces, certainly blends in well. Its entirety feels classical and is pleasantly unobtrusive – thanks to its timeless design. Even more is offered by its interior design, which, at first glance, appears fresh, minimalist and not overly complicated. The use of natural colours and materials contribute to a feeling of well-being. The thorough renovations in 2017 have resulted in the entire centre becoming more competitive. Following the renovation, the renovated part of the hall can now host events for up to 200 people in a single area, or it can also be divided into several smaller areas with the use of moveable walls. The centre has basic multimedia equipment, whilst for more demanding productions it hires equipment from verified external partners. The team is professional and has a lot of experience, including with highly demanding projects such as the Bled Strategic Forum. However, at lot of work is still required in the area of marketing and understanding the needs of today’s congress guests, which is what makes a difference in today’s market. The Bled Congress Centre was built in 1961 for a chess grandmasters tournament. In 1962 it hosted the first festival of Slovene hit music. This was followed by important congresses, concerts, exhibitions and other events, among them sports events. Over time, however, the building began to show signs of age. In 1989, prior to the Bled World Rowing Championships, it underwent a thorough renovation. An extension was added on the southern side and a larger stage was built. The gallery was replaced by several smaller halls. Nineteen years later, in 2008, the parquet flooring in the main hall was replaced, and new seating and stage equipment was installed. In 2011 refurbishment of some of the interior areas of the Festival Hall took place (foyer and toilets). The classic auditorium is famous for its good acoustics and technical equipment. Its functionality, however, could be further improved if the seating was not fixed. The Festival Hall relies on external catering providers from Bled or other reputable Slovenian catering providers such as Jezeršek Catering. The quality of the food and service is, therefore, largely dependent on the amount clients are willing to spend. 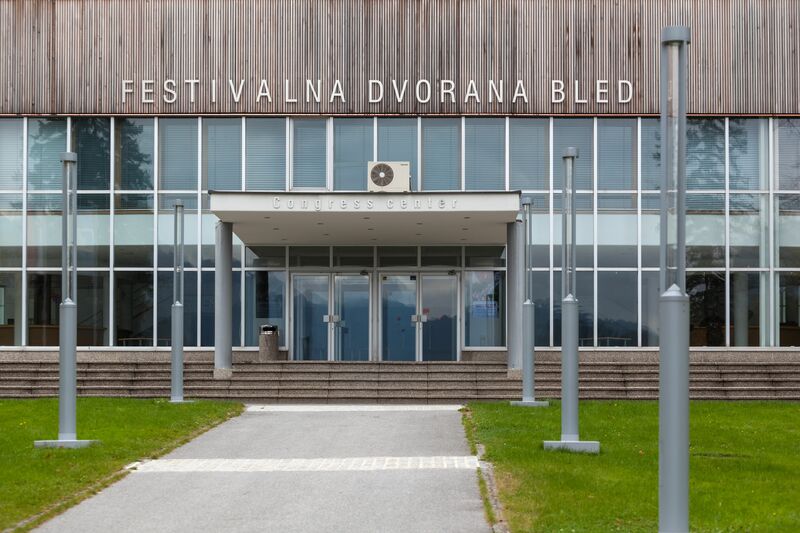 The golden times of the Bled Festival Hall have already passed, however, despite this, in the past it amassed a lot of positive references, which is why we would also expect more active marketing and promotion of the centre than it really deserves. The majority of Bled’s various categories of hotels are in close proximity to the congress centre and are suitable for congress guests. In total 2,500 rooms in hotels and guest houses/bed-and-breakfasts etc. are available. The Bled Congress Centre operates in direct co-operation with the newly-established Bled Convention Bureau, which was founded at the end of 2016 and has given a great boost to the local congress industry. The Bled Congress Centre is more well-known to the wider public as the Bled Festival Hall. It is most well known for its combination of cultural and congress programmes. The key problem of the centre remains that it has too few accompanying halls and the structure of the main hall. This problem is often addressed by hiring halls in nearby hotels. The last renovation of the centre at least partly solved this problem. Since the latest renovation, Bled Congress Centre has been shown in a new light and it feels modern and attractive. Despite this, however, it seems that in Bled the importance of the multiplicative effects that the congress centre creates are not fully realised. Many hotels have built their own small congress centres, with which they compete on the market. Opportunities, therefore, remain, and we hope that a group vision of the development of congress tourism in Bled will prevail.